U.S. Special Envoy for Climate Change Todd Stern (right) announced yesterday he will step down next month. Replacing him will be his former No. 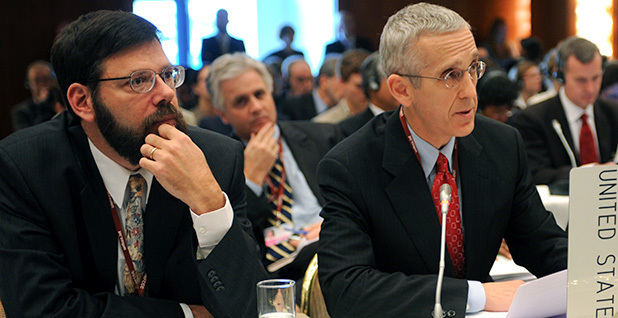 2, Jonathan Pershing (left), who is currently principal deputy director of the Department of Energy's Office of Energy Policy and Systems Analysis. Courtesy of the International Institute for Sustainable Development. Jonathan Pershing, who will become the top U.S. diplomat on climate issues next month, has spent the last three years at the Department of Energy working to make the U.S. commitment in Paris easier to achieve. Since stepping down in 2013 as deputy to outgoing U.S. Special Envoy for Climate Change Todd Stern, Pershing has been responsible for helping DOE align its advanced energy research and policy with the Obama administration's climate priorities. That's meant supporting everything from U.S. EPA's Clean Power Plan to the U.S. position at last year's landmark climate summit in the French capital. As he steps into his former boss's shoes on April 1 for the final months of the Obama administration, officials say Pershing is uniquely qualified to oversee implementation of the agreement he helped negotiate while also offering the technical and policy expertise he burnished in his DOE role to help the world meet its targets. Energy Secretary Ernest Moniz in a statement yesterday lauded his outgoing senior climate adviser's "wise counsel and good humor." "His science background and analytical skills have been put to very good use in his consistently collegial fashion," Moniz said. Pershing, a geologist and geophysicist who contributed to Intergovernmental Panel on Climate Change (IPCC) reports, oversaw DOE's release of the first Quadrennial Energy Review last year, which focused on the nation's energy infrastructure. He also had a hand in launching Mission Innovation -- a 20-nation pact introduced in Paris that called for countries to double clean energy research and development funding over five years to address climate change. His energy expertise will be vital this year as the United Nations' climate negotiations turn to making sure the Paris pledges see action on the ground, the Energy secretary said. "I look forward to continuing to work closely with Secretary [of State John] Kerry and Jonathan as our departments work towards domestic and international implementation of the Paris agreement through clean energy solutions," Moniz said. "Jonathan's new role is a homecoming of sorts for him," Kerry noted in a statement of his own, pointing both to Pershing's time as Stern's deputy between 2009 and 2013 and to his work as a U.S. climate administrator stretching back to before the completion of the 1997 Kyoto Protocol (ClimateWire, Jan. 18, 2013). The United States under President George W. Bush declined to ratify that agreement, a move that drew the ire of the international community after the Clinton administration took an active role in negotiating it. As Stern's No. 2 in the early years of the Obama administration, Pershing became closely associated with U.S. positions that still-frustrated foreign delegations said differed too little from those of the previous administration. That included an insistence on ending a strict division of responsibilities assigned to rich and poor countries under the U.N. climate convention and the avoidance of legally binding commitments of emissions cuts and aid. In fact, Pershing became in some ways more the face of those positions than Stern, some noted. Where Stern led the delegation during minister-level negotiations, Pershing was lead negotiator, representing the U.S. during intersessional meetings and during the first week of annual year-end summits. "I guess the combination of him being a pretty strong personality and doing his job effectively as the head of the U.S. delegation was troubling, because he was pushing positions that were problematic if you were thinking about him having the perspective of an IPCC scientist," said Kyle Ash, the top energy and climate lobbyist for Greenpeace USA. "I could see how some people would feel that way." Ash said the United States proposed a baseline year of 2005 rather than 1990 from which to measure emissions reductions and made other decisions that lessened ambition in ways that didn't track with the urgency embodied in IPCC reports. Pershing also had a big beard and a booming voice, Ash noted. Stern was more soft-spoken and, as a lawyer, didn't come with the same expectations that clung to IPCC author Pershing -- a member of the Nobel Prize-winning scientific body, "which has literally helped write the book on climate change and what we can do about it," as Kerry put it yesterday. Several advocates who dealt with Pershing during his years as deputy climate envoy recalled that he was sometimes seen to lecture members of civil society about their roles in the negotiations or to hold forth on scientific topics. And his tenure -- which began ahead of the 2009 summit in Copenhagen, Denmark, which failed to produce an agreement, and ended after the 2013 talks in Doha, Qatar -- was a period when the United States was often criticized as a bad actor in the U.N. climate process. President Obama had not yet made climate diplomacy a centerpiece of his second-term climate agenda, spurring domestic action and more flexibility in the negotiations. Laurence Blandford, director of international policy analysis at the Center for Clean Air Policy, said the second term ushered in a "more constructive and positive conversation" from U.S. negotiators, which eventually led to breakthroughs at last year's summit on issues like mobilization of climate finance and dealing with loss and damage from warming-related events. 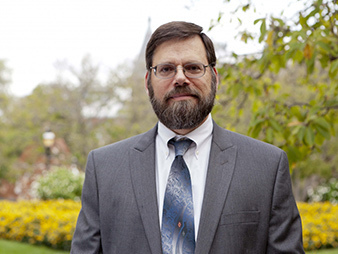 Jonathan Pershing, who through the early years of the Obama administration served as the deputy special envoy for climate change, will now lead U.S. international climate policy at the United Nations. As special envoy for climate change, Pershing replaces Todd Stern. Photo courtesy of the Energy Department. The former Canadian negotiator said he would not have thought U.S. acceptance of those provisions to be possible in years past. Blandford said Stern and Pershing deserved credit for helping to break down the firewall between rich and poor countries' responsibility under the convention -- a change that allowed Paris to cover the emissions of burgeoning developing countries. Now that nearly 200 countries have agreed on a framework in Paris, the coming year's talks will start to fill in key details and rules to ensure openness and transparency. "This year, the issues are going to be more technical," Blandford said. "The big-picture political issues have been resolved by the agreement, but now the rulemaking has to be done." Pershing's time in the trenches as lead negotiator make him a good candidate for this next phase, he said, as delegations turn their attention to nitty-gritty issues like monitoring, reporting and verification, or technology and finance. Observers also said Pershing's work at DOE would equip him to help countries map out ways to meet their commitments. Paul Bodnar, who recently stepped down as top climate adviser at the White House's National Security Council, called him "an ideal choice." "He's well-respected internationally, both as a negotiator and climate expert, and is very warmly regarded by his colleagues in the U.S. government," he said. "I think he'll do far more than bat cleanup -- he'll bring a fresh perspective about the practical challenges of transitioning to a low-carbon economy, and that's exactly what we need in this post-Paris period." "Now is the period to create the energy and technology policies that can actually implement and improve upon the Paris emissions goals," agreed Paul Bledsoe, who worked on climate issues with Stern and Pershing during the Clinton administration. "And I think that Jonathan is exactly the right person to make that transition." The Energy Department is hosting 24 countries in June in San Francisco for the next Clean Energy Ministerial, a meeting of major economies to swap best practices on energy efficiency and decarbonization. The meeting is being billed as a next stop in the implementation of Paris and will include events with several of the Silicon Valley-based companies that made commitments when Mission Innovation was unveiled. The climate community also toasted Stern yesterday for his role in bringing about last year's agreement, not only through his work within the U.N. Framework Convention on Climate Change but through his bilateral work in support of that process. "Without Todd there would be no Paris Agreement," said former Marshall Islands Foreign Minister Tony de Brum. Bilaterals with countries like Brazil and India -- and especially the 2014 breakthrough agreement in which China for the first time agreed to stop growing its emissions -- helped pave the way for more ambitious national commitments. Stern was involved in all of them. "He recognized from the beginning that developing country action was the key to climate protection, and the arc of his work can be seen as implementing that vision toward gaining increasing acceptance by major developing countries of the need to act," Bledsoe said. Stern fought successfully for a "bottom-up" Paris architecture built on voluntary, politically binding commitments by countries of all stripes. Blandford noted that the United States showed flexibility in bilateral negotiations, handing partner nations wins on issues they cared about, like technology transfer. "I think it helped to create greater understanding and addressed some of the issues that were being raised by some of those other countries as objections to taking on more responsibility," said Blandford. "As a negotiator, he knew when to be more flexible and when to hold the line in order to make progress." European representatives sometimes clashed with Stern, especially on his rejection of legally binding commitments for the Paris deal. But yesterday they said they would miss him. "Not always the easiest of the negotiators to read, but always well-intended, determined to succeed with everyone on board," was E.U. Climate Action and Energy Commissioner Miguel Cañete's appraisal. French climate envoy Ambassador Laurence Tubiana described having "a very cooperative working relationship" with Stern, particularly over the past two years leading up to Paris. "I'm happy to say, he has a capacity to listen. When I had concerns, he was totally ready to take it very seriously," Tubiana said. "He always had his own ideas, of course, but he was totally able to be flexible. He has a nice, thoughtful way of working." Tubiana added that as the U.N. discussions now move away from intense negotiations over how to divide responsibilities among countries for cutting emissions and toward the nitty-gritty of how all nations can shift their energy trajectories, Pershing makes an ideal candidate to lead the U.S. team. "It's the moment of implementation and the way forward," she said. "Jonathan knows a lot about the energy policy and the nuances. He has a lot of the concrete knowledge around energy policy." Actions taken over the next half-decade "are very central" to Paris' success, she said.